Making books at Tainabuna Primary School with Alison Lester. Alison Lester, the children's laureate, writer and illustrator is well known for her picture and story book-making with children in Aboriginal communities. 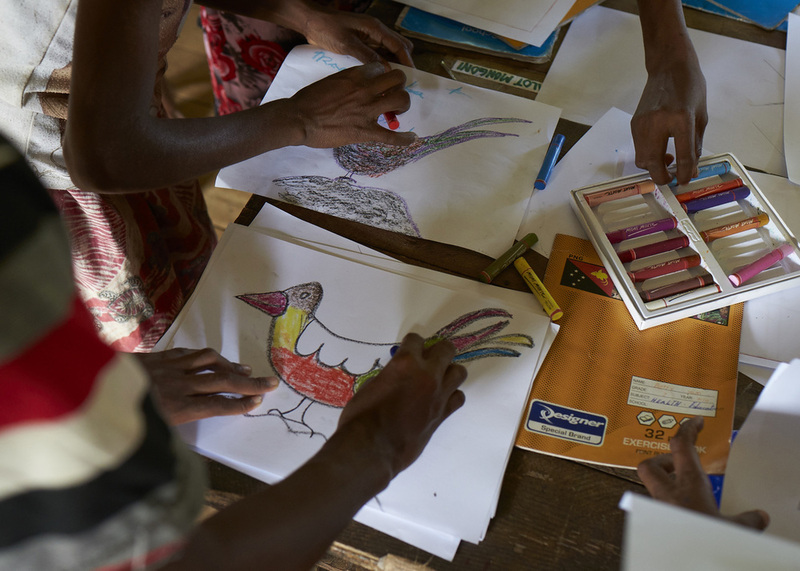 In April 2014, she made her first visit to Papua New Guinea, and brought this project to Tainabuna School with SEAM. We took the art materials – wax crayons, water-colour paint, textured paper, fine line pens, etc. We had expected 40 to 50 children and found over 100 waiting for us. Once we got started, we saw all these little eyes looking up from underneath through the gaps in the floor – the kids who weren’t enrolled - so they came in too! Alison said she’d never worked with so many children or with such focused and attentive children. It was the first time they’d used any of the materials put before them, and they did some remarkable work. By the end of the day we had paintings from every child. The following day, at Tufi Dive Resort a half hour dinghy ride away, where there is power, we worked with the teachers to produce five 32 page books with laminated covers. The art materials stayed with the school, the books are in the classrooms. When we arrived back in the villages to show the books, the children were very happy. Newer PostCape Nelson Visit, April 2015.